I’ve just returned from the Belgian Grand Prix at Spa. Although many of my students think that I’m off to a Grand Prix every other weekend, sadly this isn’t the case. In fact, I only tend to visit a Grand Prix when we’re working on a further edition of our book – Performance at the Limit: Business Lessons from Formula 1 Motor Racing. In these situations Mr Ecclestone has kindly supported our endeavours by permitting us access to the F1 Paddock, the essential place to be if you want to meet up with the movers and shakers in the various F1 teams. The first time was at Imola in 2004 – ten years after that fateful weekend when Roland Ratzenberger and Ayrton Senna lost their lives, then we were at Barcelona in 2008 working on the second edition. Now it’s time for the third edition and, as luck would have it, this time it was the Belgian Grand Prix at Spa that fitted into our publishing schedule – it is a circuit I have always wanted to visit, one that oozes from the history of F1, where else would you find a version of the circuit which was modified in 1979 being referred to as the ‘new’ circuit? It’s always enjoyable to attend a Grand Prix and to breathe in the real atmosphere of F1, but on the other hand this would hopefully be a fairly straightforward visit – interviewing some familiar and some new faces to update the F1 story and how it provides real insights for organisations and their managers to learn from. I’d managed to make contact with a few people prior to Spa to see if it would be OK for us to talk to them. One of these was Manor’s Graeme Lowdon, I’d never met him before, but I’d always thought he seemed to be a straight-forward and approachable kind of individual, and this was borne out when he responded positively to my Email within 50 mins – no passing me on to the media team, or his PA, just ‘yes, come and see me when you get to the race’ they don’t hang around in F1. This was great news, our book focused on how other businesses and organisations can learn from F1, and as Manor F1 had just effectively risen from the ashes of administration to race again – I felt that there must be some real issues here that would interest a wider readership. 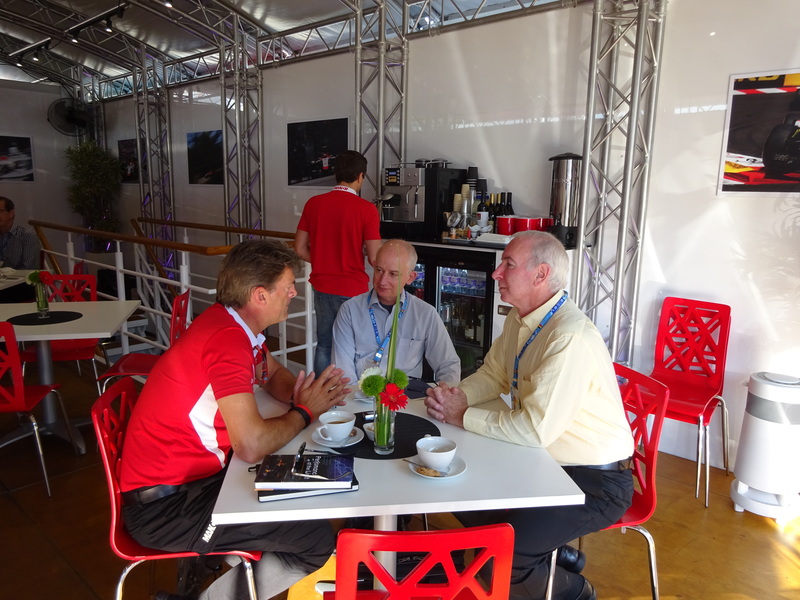 So we met with Graeme at the Manor hospitality unit and I started with the question as to how he and the organisation had dealt with the challenges it had been facing over the last twelve months and how it had managed to make it back to the F1 grid in 2015, my thought was that this would get us into a discussion about the problems of going into administration. But Graeme started talking about the 2014 Japanese Grand Prix and the dreadful accident that befell Jules Bianchi and the challenge of then going to first Russian Grand Prix at Sochi while Jules was still in a critical condition in hospital. How could I have been so crass? Why did I not anticipate that the biggest challenge the team faced was nothing to do with administration, but with the catastrophic injuries suffered by one of their drivers at the Japanese Grand Prix. Like every F1 fan I had been devastated to hear that Jules had lost his fight for life in July 2015, but somehow I had managed to separate this from the organisation and most importantly the people in that organisation. What was I thinking? Or rather why was I not thinking? How many of us can envisage a situation where one of our colleagues dies in the course of doing his or her job? Sadly, it does happen – today we woke to the sad news that Justin Wilson had succumbed to his injuries at an Indycar race – how do we then pick ourselves up from that devastation, what can those leading the organisation do to help and support others when they themselves are grieving too? And then if you realised that your business was now in a desperate financial situation that could not be immediately resolved, wouldn’t it be easier to walk away? To decide that this was the time to do something else? Not so Graeme Lowdon and John Booth of Manor F1. They pulled Manor from the ashes or perhaps more accurately from EBay, where much of the teams equipment was due to be sold, and they put themselves back on the grid where, currently they are fighting with McLaren for position, a team with around four times the budget and people that they have. We had a great time at Spa, many of the teams could not have been more helpful and co-operative – particularly Mercedes, McLaren, Williams and Sauber. But my abiding memory will always be Manor F1, what they’ve been through, but also the quiet commitment and resolve they have demonstrated, never giving up, when most of us would have been pleased to be able to do so. One term that is used now and again in F1 is ‘racer’ it means someone who has a passion and a commitment to go racing no matter what, it’s not about the money, it’s not about status or fame, but the joy of racing and the desire to win the next race. Teams like McLaren and Williams epitomise this approach, as do their leadership, and for me so do Manor F1. They have demonstrated a different order of commitment, one which shows who the real racers are. Apologies for the lack of posts recently, but I have been away sunning myself on holiday (more of this in a later post). I therefore am ashamed to say I missed the British Grand Prix, but it appears Ferrari benefitted from my lack of attention and have turned around their performance and put themselves back in contention. But what of the German Grand Prix? Well, it was an excellent race and suggests we are in for a real battle between some of the best drivers and teams that F1 has seen for many years. #F1. The fact that we had three different cars in the top three positions on the grid always bodes well and when they feature drivers of the calibre and style of Hamilton, Webber and Alonso it bodes even better. It was a great fight – particularly Lewis’s round-the-outside pass on Fernando and it was uncertain as to who would be the final winner until quite late on. A great race, and not the first one this year. Respect. There’s always much made in the media of the relationship between Hamilton and Alonso following their turbulent time together at McLaren. It’s always good for the press to stoke up a feud, but I have to say having watched Alonso acknowledge Hamilton’s victory as they drove round for the slowing down lap (before Alonso ran out of fuel) and to see them chatting before going out on the podium, I saw no evidence of two people who hated each other, just healthy respect. The Rules: Apparently (according to DC) drivers are not allowed to ride on another car (as Alonso did with Webber, bringing back memories of the famous Silverstone image of Senna riding with Mansell); and also are not allowed to leave the parc fermé area at the end of the race (as Hamilton did to celebrate with his team – or could he quickly have put some lead down his trousers before he went on the scales?). Anyway if the rules looked a bit silly, it was good that nobody seemed to be following them to the letter and common sense prevailed. Vettel: Has Sebastian lost his momentum? Fourth place is not a bad result for an off-day, but the real question is whether or not this is a trend or a blip for the reigning World Champion. Lewis suggested it was a blip in the post-race press conference, let’s wait and see. Williams: It really saddened me to see WF1 putting on the option tyre to try and make sure they got through to Q2, perhaps this circuit isn’t the best for their car, but in my view WF1 should be consistently in Q3 not fighting to make it into Q2. There appear to be three groupings of the teams so far in the season – the leading teams who are going to win races: RBR, Ferrari and McLaren; the midfield consistently in the points: Mercedes, Renault, Sauber and Force India and the back of the grid (all with zero points): Team Lotus, Virgin, HRT. The two teams who appear to be floating between groups 2 and 3 are STR with 17 points, and Williams with 4. Let’s hope like Lewis and Fernando, Williams make things happen in the second part of the season. Monaco is always a great spectacle, it is also a bit of an anachronism in terms of F1 tracks, but then that’s what makes it so special. This year’s race also underlined the dangers that are always present when racing takes place, the accident which befell the talented Sergio Perez (who looked like he was going to go well in the race) was very reminiscent of the accident that ended Karl Wendlinger’s F1 career back in 1994, only weeks after the deaths of Ayrton Senna and Roland Ratzenberger. When you see a driver remain still in the car after an accident that is always a very worrying scenario, but the most distressing part was watching Perez’s father clearly beside himself staring at the TV screen in the pit garage and wondering what had happened to his son. Fortunately it looks like Perez and Petrov will be OK, so we got away with it again, the quest for safety is one that should never stop. Vettel: It cannot be denied that Sebastian had luck on his side at this race, the big question was how long he had with his tyres, McLaren estimated that they would ‘go over the cliff’ in a few laps, when the red flag allowed him to restart with fresh tyres, I wonder if luck will continue to smile on Seb through the rest of the year, or has he now had his quota? Racing: Yet again we had an exciting race, and overtaking at Monaco! Some great moves, particular those involving Schumacher and Hamilton (Michael overtaking Lewis at the hairpin, and being overtaken by him at St Devote). Michael, unlike his earlier races, showed how to both overtake and be overtaken while keeping on the road! Alonso: Another stellar performance from the man who (using Denis Jenkinson’s terminology) is ‘a racing driver ahead of his car’. Alonso could well have won the race if Vettel’s tyres had gone off. Ferrari have done the right thing in signing him up till 2016. Pastor Maldonado & Williams: OK, Pastor was actually taken out just before the end, while in 5th Place, but this was the second time he had made it into Q3 and had driven a great race. But Rubens did at least get them some points, if only two of them. Keep it up team Willy, we want to see you back where you belong! DC’s commentary: I have been rather negative on DC as a commentator, and felt that he was very much being propped up by the very experienced Martin Brundle, however in Monaco their roles seemed to have reversed with DC being a lot more authoritative and insightful than his former manager. Sometimes it’s a pleasure to admit you were wrong. Regulations: The prospect of Vettel, Alonso and Button battling out in the final laps with different levels of tyre degradation was an amazing prospect, but sadly one that was denied us by the regulations. Perhaps next time they red flag a race they should be prevented from changing tyres? McLaren: They showed so much potential before the race, and Jenson had been very well positioned to make a bid for the lead, should Vettel and Alonso’s tyres fall away, but it wasn’t to be. I’m sure they’ll be even more determined in Canada to reign in Red Bull. Hamilton: Lewis can always be expected to provide drama at a Grand Prix. I love the way, like Alonso, he nevers stops racing, no matter where he is in the field. However this time his frustrations seemed to really get the better of him. Ron Dennis once said ‘show me a good loser and I’ll show you a loser’. Well Lewis is not a loser, but perhaps he needs to give some thought to being a bit more gracious on those occasions when he is, but then if he did he wouldn’t be Lewis would he? Reflections from Barcelona: is qualifying the real loser in 2011? So as the season now enters its second phase with the traditional European races, who are the winners and losers from Barcelona? Vettel: Looks every inch in control of the tyres, the race and the championship, not sure about the Crazy Frog impressions though. Racing: Yet again we had an exciting race, it was a big shame that Alonso’s stellar start didn’t pay dividends for him, but it was really great to see three different car/engine combinations (Red Bull Renault, Ferrari and McLaren Mercedes) running so closely in the early stages. Sauber: With the disappointment of having been disqualified from Australian, Sauber were able to underline the quality of their 2011 package with ninth and tenth places. Williams (in Q3): Pastor Maldonado was able to bring some cheer to Williams by making it into Q3 and bringing the team from Grove their highest grid position of the season so far – eighth place, although sadly he was only able to turn it into fifteenth in the race. Mark Webber: this was his chance to undermine some of Vettel’s momentum, but it didn’t happen and Mark, as usual, was pretty open about the reasons in a tweet today “Barca didn’t turn out for me in terms of top result… wasn’t good enough on the day”– so how about Monaco? Qualifying: the new regulations certainly seem to have improved the racing, although I’m not sure about DRS. However one of the casualties seems to have been qualifying. The teams are now compromising qualifying performance to ensure they have enough tyres – particularly the softer option, to remain competitive on Sunday. It is also interesting that in a couple of notable cases – Webber in China and Heidfeld in Barcelona, someone who has started last, with a full set of tyres, has been able to overhaul most of the grid: Webber finished 3rd, and Heidfeld eighth, so if grid position becomes a disadvantage is this the end of qualifying as we know it (or at least qualifying pre-2011)? Not sure if Pirelli are winners or losers, they certainly seem to be responsible for a big change in the unpredictability of the race and the variations in performance, but I’m still not sure if this is a good or bad thing – need more races to come to a final view. It was interesting to see that things seemed to have gone a bit quiet on the ‘off track’ front. For ‘off track’ read negotiations for the 2013 Concorde Agreement, which normally means things are happening behind closed doors. It was interesting to see both Ron Dennis and Dietrich Mateschitz present at Barcelona so perhaps there were a few high level meetings going on.